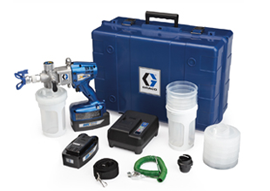 The Graco King® is an Airless Paint Sprayer which is designed to withstand the harshest environmental conditions. If you are looking for Air Spray Equipment then this Graco Sprayer is a tough performer within the airless pumps range. 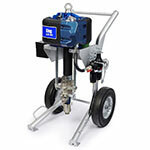 Our Graco airless spray equipment remains popular amongst our customers with good reason. The Graco King® easily handles the toughest protective coatings and corrosion control applications, making it sought after within the airless paint sprayers range. Whether it's airless spray guns, inline filters, suction inlet filters, spray tip extensions or spray tips and guards, we have a range of air operated airless accessories for all your air operated airless spray paint needs. The Graco King airless sprayers are tested to outperform and outlast all other sprayers in the market. Easily handles the toughest protective coatings and corrosion control applications. The Graco King pneumatic airless sprayers are the most powerful machines for protective coatings. This air motor has 50% less parts when compared to the NXT valve, making maintenance and troubleshooting easy. With more than 145% higher exhaust capacity in the air valve, you’ll achieve a faster, smoother changeover. The Graco King heavy duty paint sprayers are the industry standard for protective coatings, and high solids paint aplications, being robust and durable. Provides material tracking, system diagnostics and runaway control (only on data track models).